As the autumn wind begins to blow, it becomes clear hunting season is near. Those gearing up to hunt begin preparing their equipment and open a map to formulate a plan. For even the most dedicated sportsmen and women, this is where it can get a little complicated. 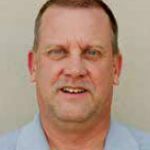 “Exactly where do I hunt?” is a question commonly posed to New Mexico Department of Game and Fish personnel. “Those hunting public land need to consider not only the good hunting spots, but also whether or not they can legally access those areas, given the mix of public and private lands,” said Ryan Darr, lands program manager for the department. 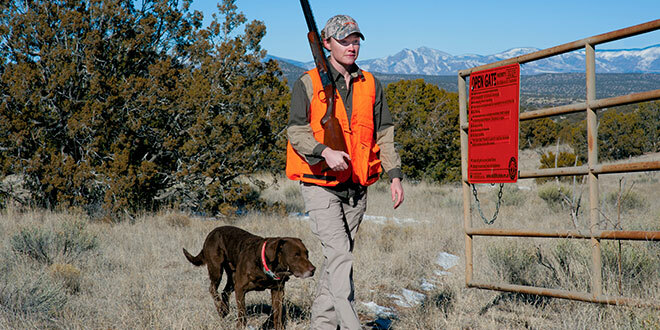 The Open Gate program improves access and enhances hunting, angling and trapping opportunities around New Mexico. The program is funded using a portion of the Habitat Management and Access Validation stamp revenue. NMDGF photo by Martin Perea. Hunters often see or hear of great places to hunt, only to find a lack of quality public land. They also commonly run into the issue of public land being landlocked by private land and therefore inaccessible. In a scenario such as this, Darr encourages hunters to visit the Open Gate program’s web page, wildlife.state.nm.us/open-gate. Users will find private lands leased through the program to afford the public with additional hunting and fishing opportunities. In addition, access routes to enter landlocked public lands are also leased and developed. Funded using a portion of the revenues from the Habitat Management and Access Validation stamp purchased by hunters and anglers, Open Gate provides multiple access routes across New Mexico as well as fishing opportunities in ponds, lakes and streams. There are also opportunities for public hunting access on private property for almost all game birds and a variety of big game. Open Gate is responsible for access to thousands of acres of land. Each property is screened by Game and Fish personnel to ensure the habitat supports sufficient game populations for public hunting before leasing access. Those heading to an area with potential access issues can review the property locator link on the website for Open Gate access opportunities. The link provides an interactive map with links to information on permitted activities, property photos, property rules, a printable map of the property and electronic driving directions to the gate. Visitors to a property can rate their experience at the website to help assure stamp dollars are being put to good use. 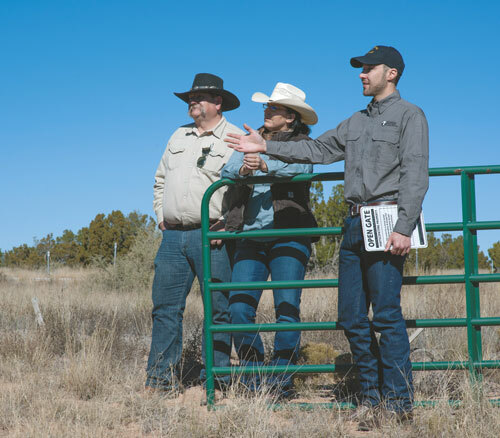 Ryan Darr, the Game and Fish lands program manager, examines an area now accessible to sportsmen and women as a result of the Open Gate program. NMDGF photo by Martin Perea. Darr would like to see additional participation in the program and those interested, or wanting more information, can contact the department at (888) 248-6866 or email ispa@state.nm.us.